Thank you for taking the time to familiarize, or re-familiarize, yourself with important information regarding the Ohio Balance of State Continuum of Care (BoSCoC). Throughout this toolkit you will learn about the BoSCoC from it’s inception to it’s best practices. We hope you find this information to be helpful as you begin, or continue, your journey as an integral part of the Ohio Balance of State Continuum of Care. Welcome to the first topic of the CoC Overview Lesson! Before diving into the specifics of the Ohio Balance of State Continuum of Care (BoSCoC) let’s discuss Continuum’s of Care (CoC) in general. While you may not use this information in your every day work, it can be important when taking a step back and looking at the bigger picture of the work you do. The following is a presentation created by the U.S. Department of Housing and Urban Development (HUD). This brief presentation will cover the history and regulations of the CoC Program. Now that you have a grasp on CoC’s in general, let’s talk specifically about the Ohio Balance of State Continuum of Care. According to HUD, “The Continuum of Care Program is designed to promote community-wide commitment to the goal of ending homelessness”. Altogether, Ohio is comprised of 9 Continuums of Care. The majority of urban counties in Ohio (Lucas, Cuyahoga, Summit, Franklin, Montgomery, Hamilton, Stark, and Mahoning) have their own Continuum of Care, and the remaining 80 non urban counties make up the Balance of State Continuum of Care. The Ohio Balance of State Continuum of Care (BoSCoC) represents the 80 largely suburban and rural counties in Ohio. Within these 80 counties there are approximately 400 homeless programs including emergency shelters, transitional housing, rapid re-housing programs, and permanent supportive housing. On any given day, these programs can serve over 7,700 persons experiencing homelessness. The Ohio BoSCoC is divided into 17 homeless planning regions. Each region has their own lead(s) who help organize and keep the region moving forward as seamlessly as possible and ensure all funding requirements are being met. 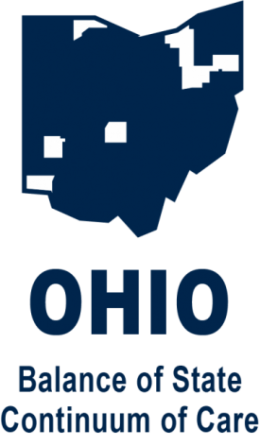 In terms of organization over all 80 counties and 17 regions, the Ohio Development Services Agency, Office of Community Development (ODSA), has been designated by the Ohio BoSCoC Board to serve as the Collaborative Applicant and the grantee for the CoC Planning grant. Additionally, ODSA staff serve as co-chair of the Ohio BOSCOC Steering Committee and have a standing seat on all other BoSCoC committees/workgroups. As previously mentioned, the state of Ohio is divided into 8 entitlement communities and the Balance of State of State Continuum of Care (BoSCoC). The BoSCoC is even further divided into 17 homeless planning regions. 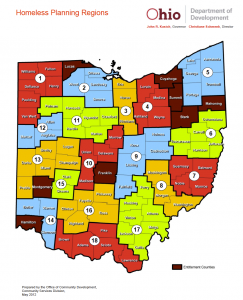 Below you will find a map created by the Ohio Development Services Agency, that illustrates the 8 entitlement communities and the 17 planning regions within the BoSCoC. All state and federally funded Ohio BoSCoC homeless projects must use the Ohio BoSCoC Homeless Management Information System (HMIS) to maintain client and project-level data. The Ohio BoSCoC HMIS is a valuable resource because of its capacity to integrate and unduplicated data across projects in our CoC. HMIS aggregate data can be used to understand the size, characteristics, and needs of the homeless population at the client, project, and community level. The only exception to the HMIS participation requirement is for domestic violence victim services agencies, which are prohibited from entering data into HMIS and must instead use a comparable database. All Ohio BoSCoC homeless projects participating in HMIS must abide by the Ohio BoSCoC Policies and Procedures Manual, which lays out the CoC’s policies related to maintaining system security and client confidentiality, as well as the CoC’s processes for complying with all federal regulations related to the creation and maintenance of an HMIS. Homeless projects must also comply with the Ohio BoSCoC Data Quality Standards, which outline expectations for ensuring that quality data is entered into and maintained in the HMIS. Different agencies use different definitions of homelessness, which affect how various programs determine eligibility for individuals and families at the state and local level. Ohio BoSCoC homeless projects must document and maintain records related to participant eligibility and the services provided to participants. In relation to homeless status, providers must maintain records documenting acceptable evidence of participants’ homeless status. Acceptable evidence generally includes third party written verification of participants’ stay in an unsheltered location, in an emergency shelter, or in a Transitional Housing (TH) program (where participants are eligible to move from TH into Rapid Re-Housing (RRH) or Permanent Supportive Housing (PSH), for example). Also remember, when documenting homeless status, HUD requires compliance with their preferred order of priority. This means that homeless status must be documented first with third-party written verification of homelessness (HMIS record, documentation on letterhead from shelter or TH project). If that documentation is not attainable, only then can third-party oral verification be used as documentation, and only after case workers have documented their due diligence in attempting to obtain third-party written verification of homeless status. Self-certification of homeless status is only permitted if neither third-party written nor third-party oral verification could be obtained, and due diligence was documented. Coordinated Entry (CE), also known as coordinated intake or coordinated assessment, is a system that allows for coordinated entry into a local homeless services system, as well as coordinated movement within and ultimately exit from the system. Coordinated Entry increases the efficiency of a homeless assistance system by standardizing access to homeless services and coordinating program referrals. In particular, an improved CE system will help the Ohio Balance of State Continuum of Care (BoSCoC) to advance our goals of helping households quickly access appropriate services to address housing crises, increasing exits to housing, decreasing length of time homeless, and reducing returns to homelessness. Access: ensures the entire Continuum of Care (CoC) area is covered and that service access points are easily accessible and well advertised. Assessment: standardizes information gathering on service needs, housing barriers, and vulnerabilities. Referral: coordinates the connection of individuals to the appropriate and available housing and service intervention. Stakeholders in homeless systems need to be aware of the various access points into the homeless system in a given region or county. Clear understanding about points of access into the system helps ensure that persons experiencing homelessness, or at-risk of homelessness, are most quickly and effectively entered into or diverted from homeless systems as appropriate. Access points must be willing and able to serve those who are fleeing or attempting to flee, domestic violence, dating violence, sexual assault, or stalking but who are seeking shelter or services from non-victim service providers. Access points must be able to serve domestic violence victims in ways that help ensure safety if no victim service provider is available. Names of providers serving as CE access points. Identification of all parties entering into the MOA. Contact information per the procedure below. Agreement that any needed changes will be communicated to all parties. Hours of operation, including after-hours information. Standard No. 3B – All CE access points are easily available both for those needing to call and those needing to visit in-person. Victim service providers may choose to only make their phone numbers available and conduct Diversion Screening over the phone, as long as other local access points can accommodate in-person meetings. Standard No. 3C – Homeless Planning Regions’ access points will be listed on COHHIO’s website for reference. The Homeless Planning Region Executive Committee is responsible for updating the access point list annually and sharing any changes with CE staff. Diversion determines if a household experiencing a housing crisis can return to housing or find alternative housing outside of the crisis response system. Diversion involves utilizing mainstream resources and mediation techniques to assist the household in identifying alternative housing options, including but not limited to returning to their own housing, staying with family/friends, or relocation to another area. Diversion should only take place with people who are literally homeless or at risk of homelessness within seven days prior to the potential housing crisis. Providers should incorporate a strengths-based, person-centered approach to help the household maintain or find safe, stable housing. The Community Resources List includes information on mainstream services including, but not limited to local food/clothing pantries, healthcare providers, benefits banks, employment/job training services, and legal services and is distributed to both clients as well as persons who are diverted from the crisis response system so that they can pursue non-housing related assistance on their own. The Homeless Planning Region’s lead agency will update the Available Housing List and Community Resource List annually. The Available Housing List and Community Resource List will be available on every provider’s website in the region and/or each provider will also have hard copies to reference and distribute to clients as needed. According to HUD Permanent Supportive Housing (PSH) is permanent housing with indefinite leasing or rental assistance paired with supportive services to assist homeless persons with a disability or families with an adult or child member with a disability achieve housing stability. Put simply, PSH is decent, safe, and affordable housing for persons experiencing homelessness and who also have a disability. Chronically homeless individuals/families with the longest history of homelessness and most severe service need. Rapid Re-Housing (RRH) is a short-term intervention to help individuals and families exit homelessness as quickly as possible, move into permanent housing, and achieve stability in housing. Furthermore, RRH projects/services funded through HCRP are permitted to serve households currently residing in Transitional Housing. However, RRH projects funded through HUD’s CoC Program can only serve persons/households currently in emergency shelter or unsheltered locations. RRH projects should be targeted to individuals and households who are unable to resolve their homelessness on their own but do not have service needs so great as to necessitate movement into Transitional Housing or Permanent Supportive Housing. Within this population, RRH providers should prioritize those with greater vulnerabilities and less likelihood of exiting homelessness without rapid re-housing assistance. Additionally, when there is an eligible homeless veteran who is not eligible for VA programs, RRH providers should prioritize the homeless veteran for assistance. The purpose of Transitional Housing (TH) projects is to facilitate the movement of homeless individuals and families to permanent housing as quickly as possible. TH projects should be targeted to persons who have been assessed as not being able to quickly resolve their homelessness on their own, but who do not have needs great enough to necessitate placement into Permanent Supportive Housing. Appropriate target populations may include those with service needs that have been identified as being more long-term in duration, but not indefinite. These may be target populations such as domestic violence survivors, individuals with histories of substance abuse disorders or those in early recovery, or transition aged youth. Within identified target populations, TH projects should further screen homeless applicants to identify people with greater vulnerabilities and prioritize those applicants for assistance. Low barrier systems refers to keeping program entry requirements and pre-requisites to a minimum. For example, a low barrier program would eliminate sobriety and income requirements and other policies that make it difficult to enter and/or access a program. If used effectively with housing first, systems can increase exits from homelessness to stable housing and lower lengths of time homeless. When working with clients it is important to document your interactions in a clear, accurate, objective, and concise manner. Documentation is important for several reasons. For one, it helps the service provider recall the circumstances and history of a client that they are working with. It also allows agencies the opportunity to quickly learn about a client and their situation should the provider not be able to assist them in an emergency or if they have left the agency. And always remember…If it isn’t documented, it didn’t happen! Finally, we want to address the importance of self-care. As social service professionals we spend a lot of our time consumed in other people’s crisis’ and trauma. Many times the work that we do even comes home with us at the end of the day and we either find ourselves literally working at home, or consumed by thinking about the work that we have left behind. While doing those things can be fine in moderation, it is imperative that we find ways to take care of ourselves so that we can continue to best serve our clients and avoid burnout.